We would study until 1:30 a.m. Wake up at 6:30 for breakfast and have class from 8:30 a.m. to 5:30 p.m. That night, we would start the cycle again. The lack of sleep and the delirium that ensued got to us eventually. We ate all our meals at the dining hall, whether we were unresponsive in the morning, starving at lunch or zombified at dinner. After a while, it was just easiest to take a plate of fries, smother them with ketchup and chow down, grabbing a few cookies on the way out. I decided to try coffee a few days in. I usually reserve my coffee consumption to one day a year, and this day was going to be it. My eyelids were heavy, but my hand couldn’t stop jittering. I felt the caffeine coursing through my veins. I felt the ulcer forming in my stomach. Worst of all, I felt my entire system weakening. At the end of the day, I felt like passing out, and I had to do something if I was going to study all night. I needed protein. As a pescatarian, I plan beans, eggs and other protein-rich foods into my diet. But as my meals were becoming less of a priority, so was my health. 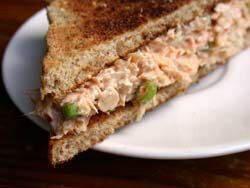 That night, I grabbed a plastic fork and plastered tuna salad on a soft roll, topping it with a slice of American cheese. Mmmm. After dinner, I felt better. I studied hard that night, making up for the work I had been slacking on. Every meal following, I made sure I had my protein. Because if you don’t eat right, other tasks are just that much harder.